Clifford the Big Red Dog may be big and red, but as far as he´s concerned, he´s just like any other dog. That´s why, when Clifford tries to do what other dogs do, things can get a little out of hand. Sometimes he gets into trouble. Sometimes he saves the day. Most of the time he has a lot of fun. All of the time he´s a good dog and a true friend. Build skills on your way to Clifford´s BIG Party. 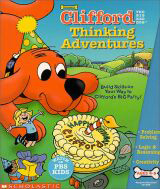 Travel through Clifford´s fun-filled neighborhood and help prepare for his BIG birthday party by completing entertaining activities that develop problem solving, reasoning, and creativity. Comments: This game is for older kids that have the concept of what comes next or before.